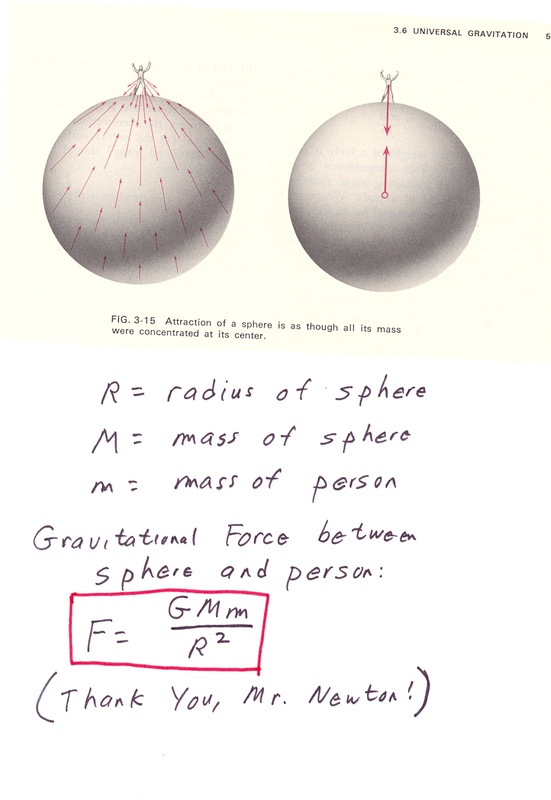 Gravitational force external to a sphere. What is the gravitational force between you and the Earth? There is a pull of gravity between you and every part of the Earth- from the rocks right below your feet to those on the other side of the planet, and everything in between! As the force varies with distance, we have to add up the force between you and every piece of the Earth, taking into account the different distance of each piece from you. Yikes! Sounds like a problem in integral calculus. Indeed, Newton essentially invented calculus to solve this very problem. Newton showed that, for certain conditions, the pull of gravity external to a sphere is the same as the pull of a point mass at the center of the sphere. The main assumption is that the density of material in the sphere is spherically symmetric- that is the density depends only on radius. The density does NOT have to be uniform throughout the sphere. Geosynchronous satellite orbit. A geosynch orbit is one in the Earths equatorial plane at a distance from Earth (determined from Kepler's 3rd law) where the period of revolution is 24 hours, or one day. At this special distance from Earth, a satellite completes one revolution each day, so (from Earth) it appears to be fixed in the sky- it does not rise and set. The satellite and Earth turn at the same angular rate, each completing one "turn" each day. Because the satellite appears in a fixed spot in the sky, you can point a satellite dish (antenna) at that spot and always be pointed at the satellite. Thus, many communication satellites and broadcasting satellites are located at geosynch. Famous science fiction author Arthur C. Clarke was one of the first to suggest the use of this orbit for communications satellites (back in the 1940s!) and so this region of space is sometimes called the "Clarke Belt". Geosynchronous satellite distance.. This is a diagram where the size of the Earth and the distance to the satellite are to scale. A geosynch orbit is about 6.6 earth radii from the center of the earth, or at a "height" of 5.6 radii above surface. Potential Energy (PE). Astronomers put the zeropoint of potential energy of two bodies at "infinity". Consider two masses initially at "infinity" (very far apart) and initially at rest. At this point, the kinetic energy (KE) is 0 (at rest) and the PE is 0 (by definition of PE zeropoint). So the total orbital energy is 0. As time goes on, the particles will start moving towards each other by their mutual gravitaional attraction. The force will increase as the particles get closer, and their speeds will increase. Thus, the KE (green curve) must increase with time. By conservation of energy, the TOE must remain 0 at all times, so as the KE goes up, the PE *MUST* go DOWN (pink curve). By integrating the force of gravity with distance, we can find the work done by gravity, which gives us the KE as function of the distance between the bodies. The PE must be the negative of that. 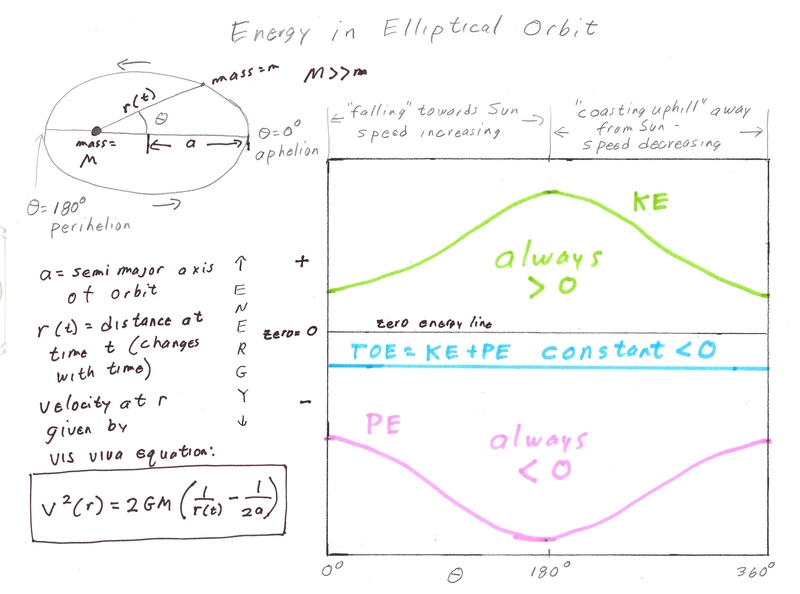 KE and PE in elliptical orbit. As an object orbits the Sun in an elliptical orbit, its speed and hence its KE (kinetic energy) constantly changes. The object speeds up as it "falls towards the Sun" moving from aphelion to perihelion, then slows as it "coasts uphill away from Sun" from perihelion to aphelion. Note that the object does NOT stop moving at aphelion- the KE is always a positive, non-zero value. (If the object ever stopped moving with respect to Sun, it would fall straight towards center of Sun and collide with it.) Note that the PE and KE curves are mirror images of each other. 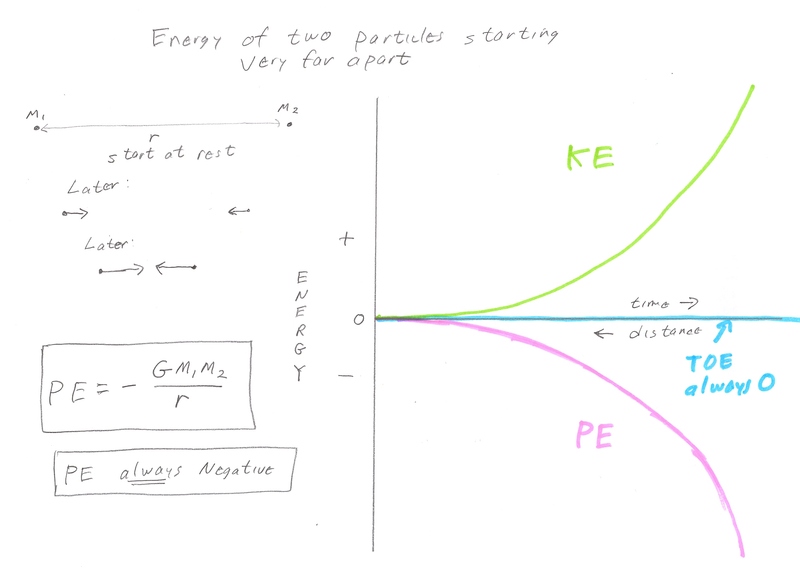 KE + PE sum to the total orbital energy, which has a constant value less than zero (because this is a bound orbit). Relative orbit. The semimajor axis to be used in Keplers 3rd Law is that of the *relative orbit*, that is, the orbit of body A as seen from body B (which is the same size as the orbit of B as seen from A! 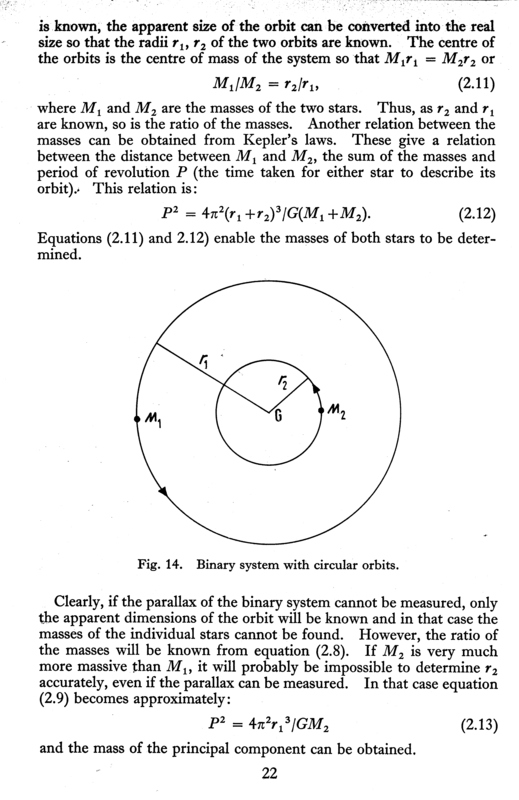 ), **NOT** the size of the orbits as seen from the center of mass of the system. This is not obvious, but falls out easily if you go through the algebra- physically, you can see that the gravitational force depends on the separation of the bodies FROM EACH OTHER, not the separation of the bodies from the center of mass of the system. Note that in eq. 2.12, they use (r1+r2) instead of a (this example is for circular orbits, but same idea holds for elliptical.) r1 and r2 are the distances of the bodies from the center of mass of the system.